Chrissy Teigen and Jodie Comer looked sensational in gowns by Arab designers at the 24th Annual Critics' Choice Awards. Awards season is officially in full swing. Just one week after the Golden Globes, Hollywood's celebrations carried on Sunday with the Critics' Choice Awards. And the ceremony that rewards art from the big and small screen and gets TV and movie stars united on the blue carpet inspired the stars to dress to impress once again. Click through to see our gallery of the blue carpet looks we crowned the best while the stars arrived at the Barker Hangar in Santa Monica, California. Claire Foy, the recipient of the #SeeHer Award and Best Supporting Actress nominee for her role as Janet Armstrong, wife of Neil Armstrong, in “First Man,” stood out from the sea of gowns. The British actress chose a black asymmetrical jumpsuit with a sweeping sleeve, halter-style sparkling bodice and belted trousers by Céline. 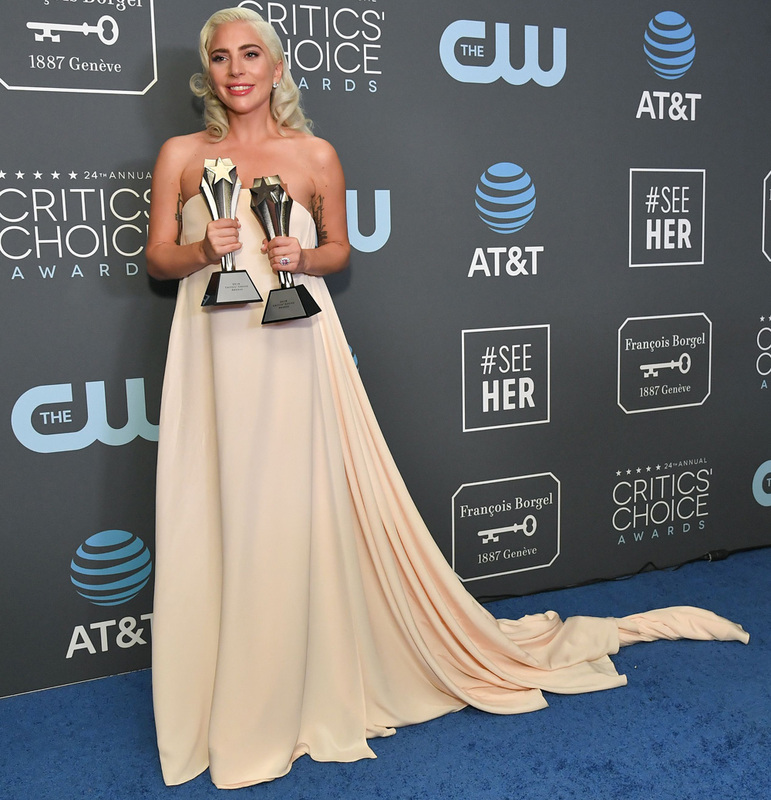 Lady Gaga, who tied for Best Actress in a Motion Picture with Glenn Close and won for her song “Swallow,” was the picture of elegance. The “A Star is Born” actress kept things simple and stylish in a Grecian-style minimalist, strapless white and blush sheath with a long train by Calvin Klein By Appointment. Best Supporting Actress winner Regina King showed she rules when it comes to blue carpet dressing too. The "If Beale Street Could Talk" star rocked a perfectly tailored shimmery off-the-shoulder purple Michael Kors Collection gown with a revealing slit. Gemma Chan’s pick is proof flower power never gets old. The actress who stars in "Crazy Rich Asians," which one Best Comedy, looked fabulous in a statement off-the-shoulder floral dress by Jason Wu that featured pockets and an exaggerated train. Charlize Theron’s metallic moment was simply breathtaking. The "Tully" actress looked like a silver siren in a shimmery tie-dye ombré one-shoulder cut-out diaphanous dress by Givenchy. Kiki Layne stunned in a sparkling blush-toned gown that featured a thigh-high slit. The “If Beale Street Could Talk" added a pop of colour to her Atelier Versace creation with a deep cranberry lip. Emmy Rossum crushed it in a velvet dress with a plunging neckline by Ralph Lauren. The dress’s wintry wine hue looked so great on the “Shameless” star. Emily Blunt and her husband John Krasinski looked white-hot in their matching ensembles. The “Mary Poppins Returns” star, who earned two nominations, slayed in an embellished Prada dress with a peephole neckline and sparkly straps. Nominated for Best Actress in a Movie/Miniseries, Laura Dern turned up the heat in a stunning sequinned Saint Laurent column gown. The black slinky cut-out dress definitely made Dern, who stars in "The Tale," a blue carpet winner. We love the way Kristen Bell surprised us by injecting some colour and matching her deep blue sheath to the Critics' Choice Awards carpet. "The Good Place" star’s figure-hugging Cushnie dress also had the most gorgeous subtle sheer detailing with a mesh panel across the bust. Jodie Comer looked very elegant in a long sheer white Zuhair Murad dress. The “Killing Eve” star’s gown featured three quarter length sleeves and an all over embroidered pattern. Jameela Jamil looked rocking in a strapless polka dot gown by Oscar de la Renta. The TV host turned “Good Place” actress teamed fashion and function together by wearing combat boots with the emerald and black dress. The clever fashion move came after hiding jeans under her dress at the 2019 Golden Globes! Laura Harrier was wondrous in a gorgeous white Louis Vuitton dress. The “Spider-Man: Homecoming” star’s choice was sprinkled with crystal stud detailing throughout and had a low-cut front, long sleeves and a long slit up the leg. We’re still swooning over the Maison Yeya dress celebrity stylist Monica Rose chose for model and social media darling Chrissy Teigen. The silver-grey gown by the Egyptian designer Yasmine Yeya featured a thigh-high split, lovely sweetheart neckline and a waist-cinching embellished belt. Poppy Delevingne looked every inch the Greek Goddess in her flowing white gown. The “Riviera” star’s Oscar de la Renta choice came with a gorgeous criss-cross back and plunging neckline.